Troy Brown approached us for an emergency task in seeing how fast we could get a site online for his studio. We had an extremely short time-frame in which to get a simple site launched that had basic interconnections, specific photo imagery, and a design that quickly communicates what he does and how well he does it. Since launch, Troy has had no complaints and an ongoing stream of traffic. This was one of our easiest and problem-free launches in such a short period of time. “Working with Sean was a pleasure. I was very unsure of building a website and writing code. Sean put me at ease and offered several levels of help and ensured his participation throughout the project. His updates on were easy to follow and he finished all the tasks I needed in a timely manner. 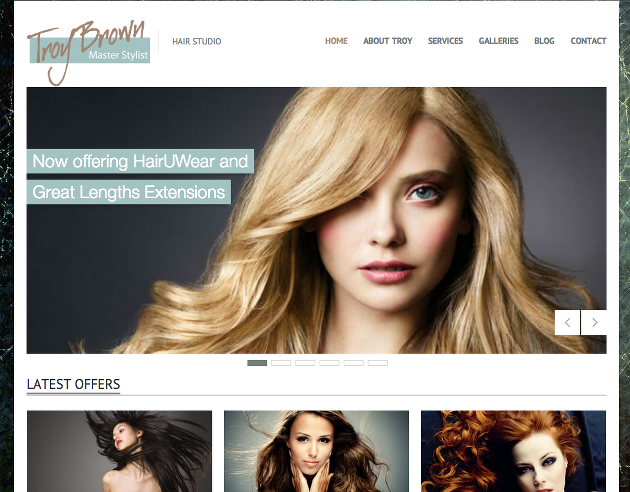 The end result is a website that I am proud of and I learned some new computer skills as well.” – Troy @ Troy Brown Hair Styling.